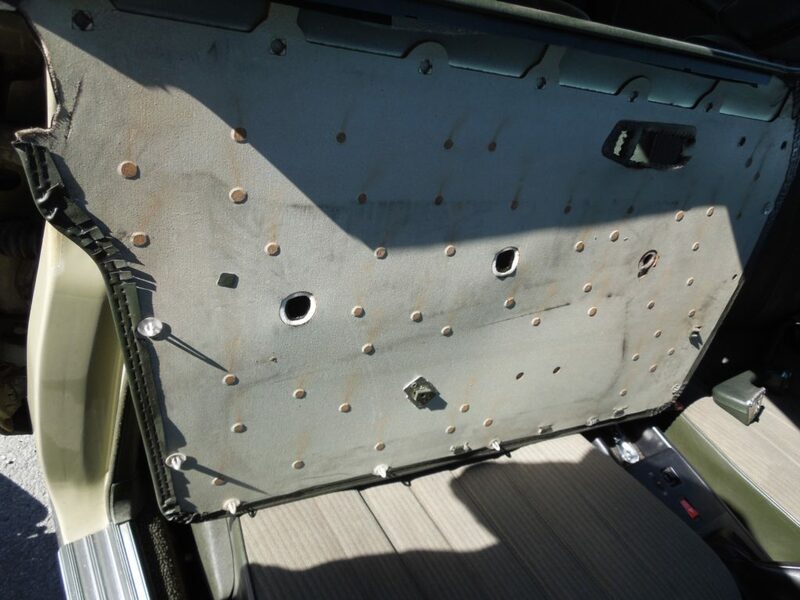 This is an easy job, but unless you know all the hidden screws and plastic tabs you might break the interior, and there are no new interior parts on the market so take care of your door panels or it can become very expensive. 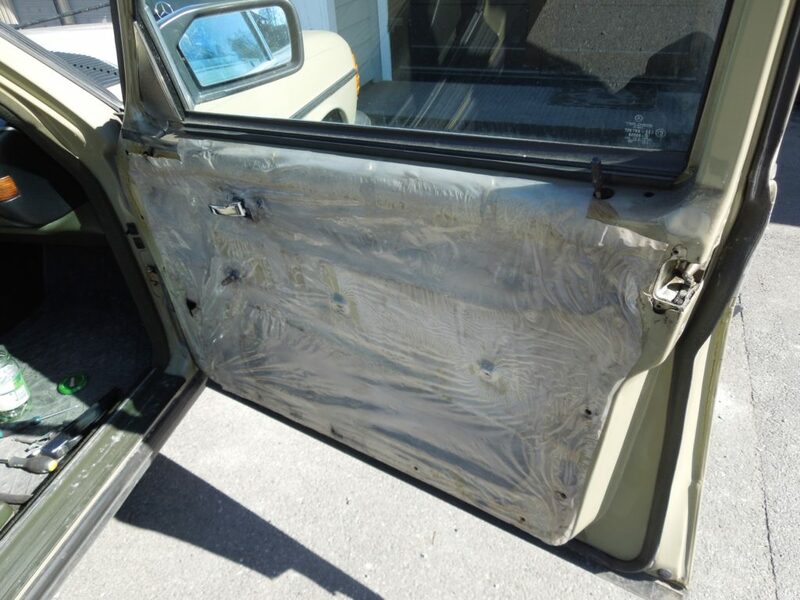 You need to take off the door panel every time you need to lubricate the window mechanism, the door check strap or to clear out the water drains from muck. In this case I had to remove the door panel t change the outside door handle after a break in. 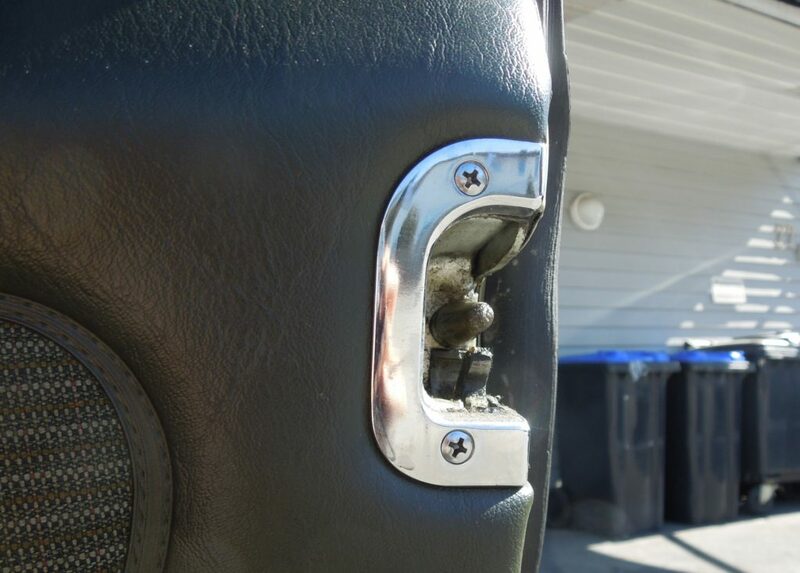 You should get some spare nylon clips before you remove the doors, since they have a tendency to break. Pry open the plastic cover behind the inside door handle then locate a hidden screw beneath plastic cover in the inside door handle. 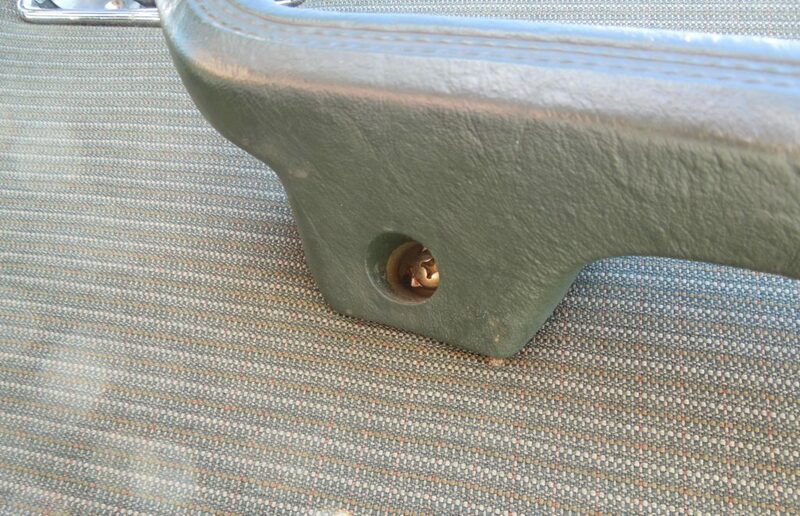 Locate the two large screws inside the right arm rest/ door puller. 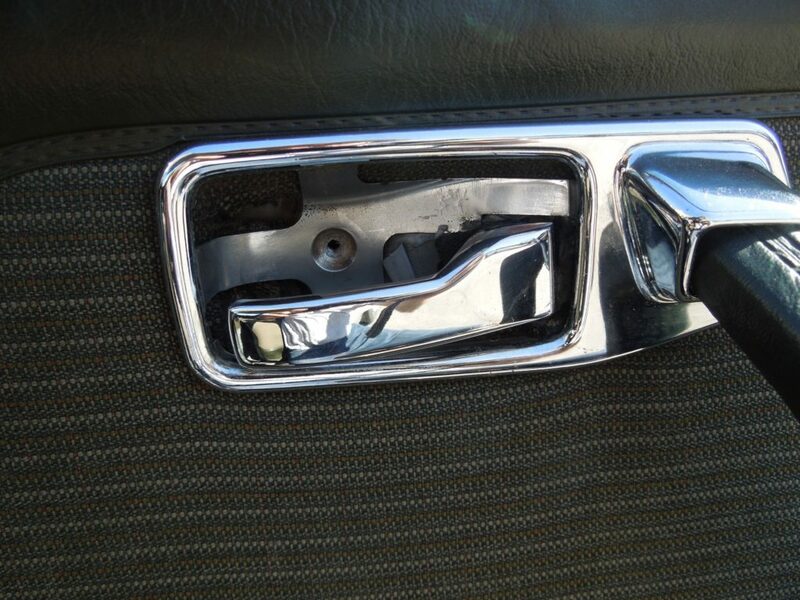 Then Pull out the chrome cover for the inside door handle and find the third and large screw for the arm rest. If you are so lucky (or unlucky) to have a manual window regulator mechanism. You have to pull off the window regulator handle, drag the plastic cover straight upwards from its center to get it off. 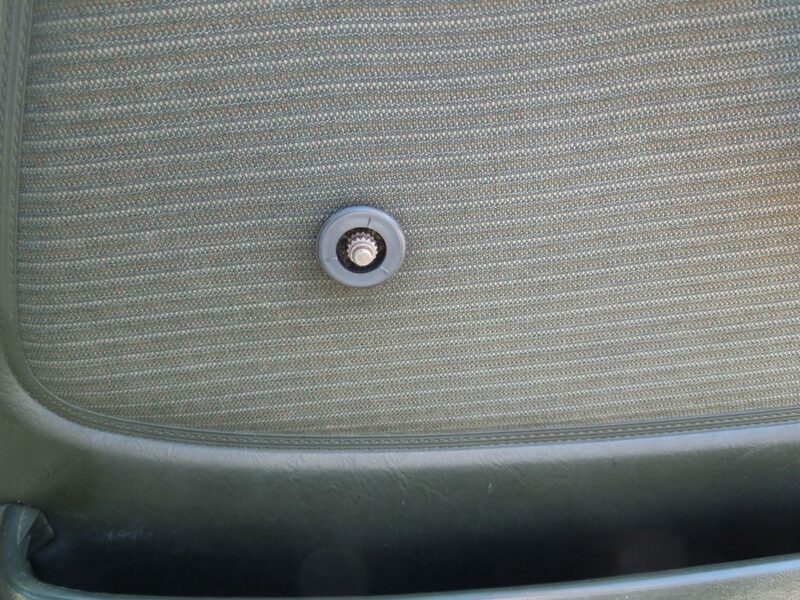 Remove the two screws from the door striker chrome cover. Now comes the tricky part. The front upper corner of the plastic pocket in the door has a plastic clip that sits in the door frame. To get this one off you can not pull outwards on the lower door panel! You must first loosen all of the plastic clips around the door edges. To do this use a flat plastic pryer to work your way around the edges of the door panel. 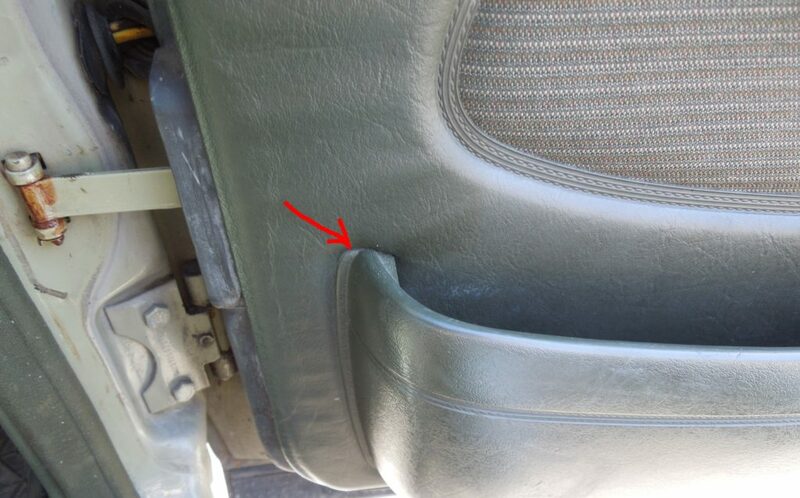 When they all are loose you can pull UPWARDS on the door panel and the clip for the plastic pocket will loose (see image). The only thing that is attached to the car then is the upper edge door panel. Just pull more upwards and it will come off. The door has a plastic sheet over the door holes to keep moisture from deteriorating the door panel. Because rain water from the outside window runs down into the door slightly between the seals and leave from holes at the bottom of the door. The plastic cover protects moisture from destroying the door panel. The car is not a u-boat and therefore this plastic sheet needs to be there. If it’s old, cut out a new one from some heavy plastic and just replace it. Just use some light glue just to keep it in place while putting the panel back on. 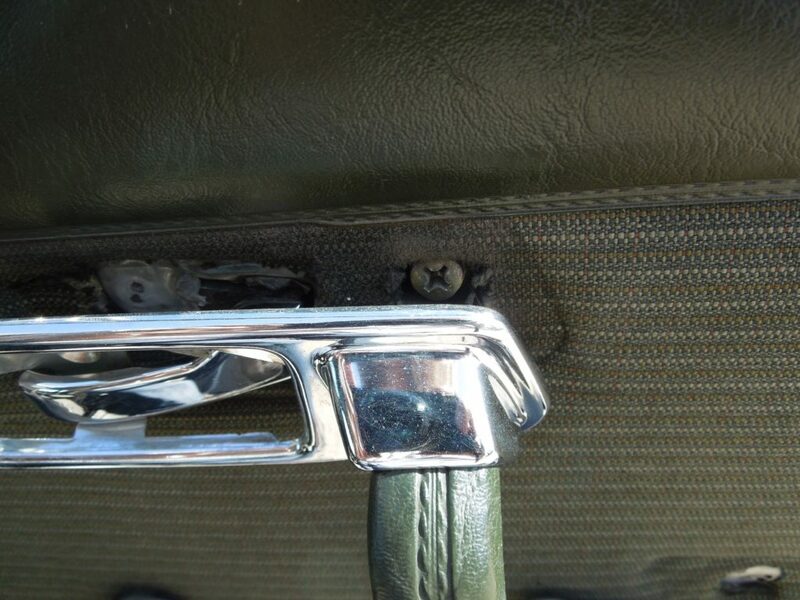 As you can see here the edges of the door panel has many white plastic clips, usually some of these old ones break and they are good to have some spare ones at hand. New spare nylon clips you can still buy, so go get a bunch of them so you have spare ones!. Installation is slightly trickier, since you have to first slide the top side over the door edge while at the same time getting that door basket plastic tab hooked in, all while you are not breaking any of those nylon clips.